floral & more manly scented natural soaps. I love all things retro. I scoured the Earth for my 1970's orange wall-mount rotary dial phone. I prefer actual paper-and-ink books to e-readers, and wear my grandma's apron when I cook. When the liquid soap trend burst on the scene, sure, I dipped my toe in and succumbed to the beguiling cucumber melon and plumeria scented soaps of Bath & Bodyworks along with the rest of them. But for some reason, I drew the line at hand soap, preferring bar soap in the shower and bath. It certainly suits my claw-foot iron tub better and those soaps with lots of lather are drying to the skin. Besides, I've always been skeptical of the antibacterial soaps. After all, they are only effective at killing bacteria on your skin if you wash your hands for a full two minutes, and other than surgeons, who does that? Some scientists believe that antibacterial soaps and hand sanitizers contribute to the development of antibiotic resistant germs. I'm not talking about the big box store brands, of course, and not the melt-and-pour glycerin novelty soaps (which are cute but terrible soaps), but, rather, the handmade natural soaps containing no chemicals or animal or human fats; with ingredients like shea butter, aloe vera, olive oil, essential oils and herbs made in the USA (or better yet, North Carolina), not tested on animals, and without the tons of plastic bottle packaging that most people don't recycle that comes with liquid soaps. can be found locally at the Cobblestone Farmers' Market. Need more reasons to go back to the bar? I love all those lists of "other" uses for an item. So here's one for bar soap. 1. Sticky Drawers (and windows): Rub bar soap on drawer glides to keep them from sticking. This also works on the sliding elements of windows. 2. Lube: Rub on screws and saw blades to help ease into a particularly dense piece of wood. 3. Pin Cushion: Wrap a piece of soap in fabric for a simple pin cushion. Again, the soap will help the pins glide into their target easier. 4. Sachet: Place a bar of strongly scented soap in a drawer to scent clothing. I like to keep a bar in my car door pocket as a car freshener. 6. Garden Pests: Rabbits in the garden? I've read that slivers of pungent soaps, such as Irish Spring repels them. 7. 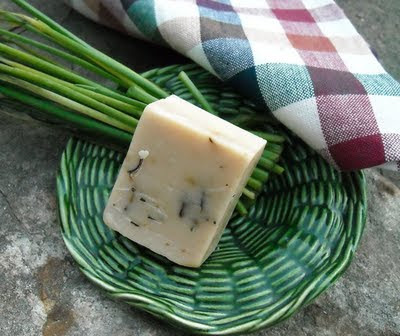 Pest Repellent #2: Use a citronella soap before heading outside to help repel mosquitoes. 8. After Bite: Slightly dampened soap rubbed on a mosquito bite eases the itching. 9. Laundry Pre-treatment. Keep a bar of white or light-colored bar soap in laundry room to pretreat stains. Just dampen and apply before washing - works well on fabric softener stains too. 10. Artists' Medium: Carve figurines out of bar soap for fun or just use it to write on the windows. It washes off much easier than the chalk window markers. I've also heard that you can put it in your bed to help with Restless Legs Syndrome. Ooh! Good one, Steph. I need to tell a few folks about that one. Ok, I too, wear my grandma's apron when I cook! And I am a bar soap user! Thanks for all the soap uses! :-) I haven't thought of using it as air freshener before; good one! 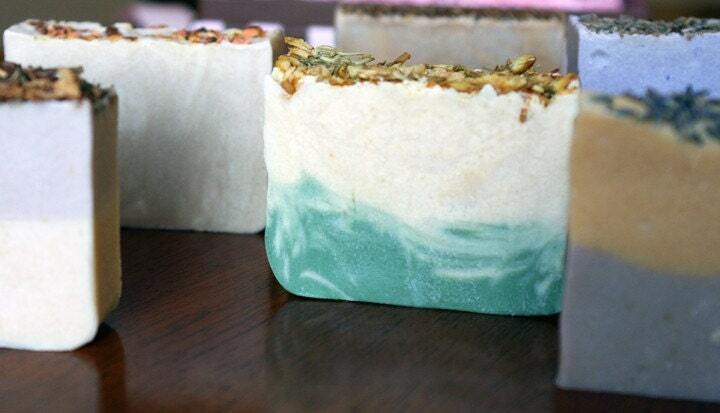 Thank you so much for including my soaps in your post. I can't tell you how much I appreciate the little promo. I'm a total addict of homemade bar soap...it's what we use in the shower and at the sink. If you're ever in Asheville, go to Biltmore Square Mall to the Appalachian Naturals store (it's probably the only store with any value in the whole so-called mall). He makes AMAZING soaps, and shampoos, etc. That's good to know that goat's milk soap is recommended by pediatricians, Erin. Thanks! I'll have to check out that shop next time I'm in Asheville, Jenny. Thanks!